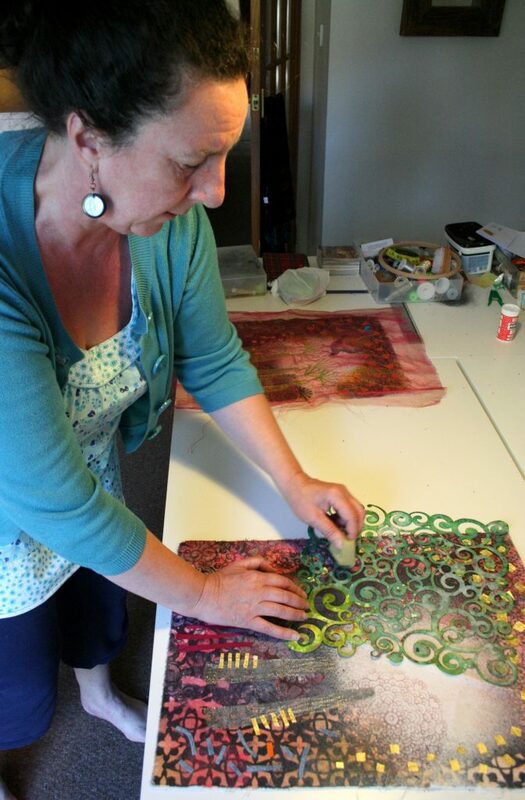 Today we talk to Angie Hughes, a gifted and published textile artist and tutor based in Herefordshire. 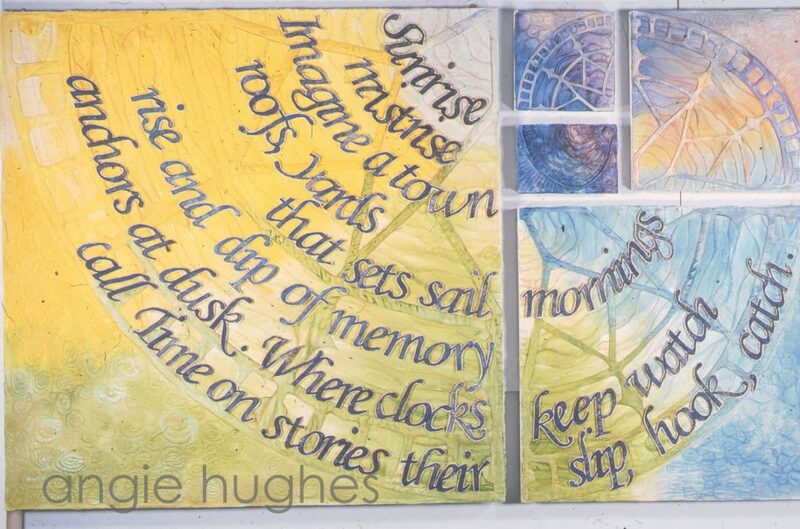 Angie studied a City & Guilds Creative Embroidery at Malvern Hills College and won the prestigious Charles Henry Foyle Trust Award for Stitched Textiles with her piece ‘Unfolding Word’ which had a unique concertina-like construction. Her pieces are constructed with care incorporating all the things that inspires her. 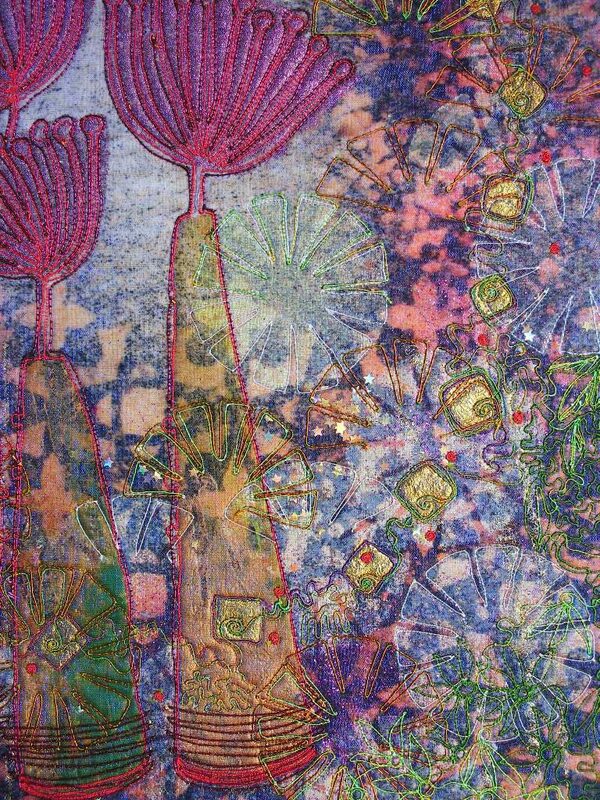 Text, poetry and nature are so prevalent in her work it often defines her style. 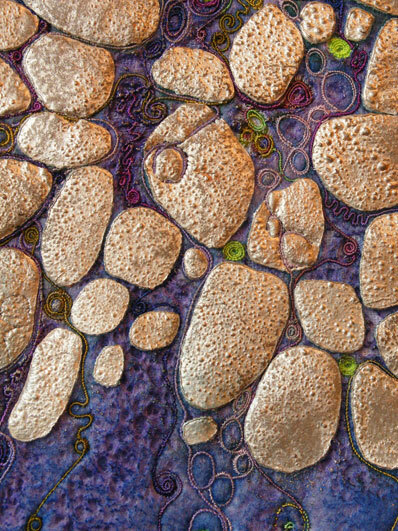 She teaches to Guilds and groups all over the country, and her latest book Stitch Cloth Paper and Paint is a current best seller for Search Press. Tell us about some of the projects you are currently working on. At the start of the year, while it was quiet, I set about redesigning my website and taking care of business. 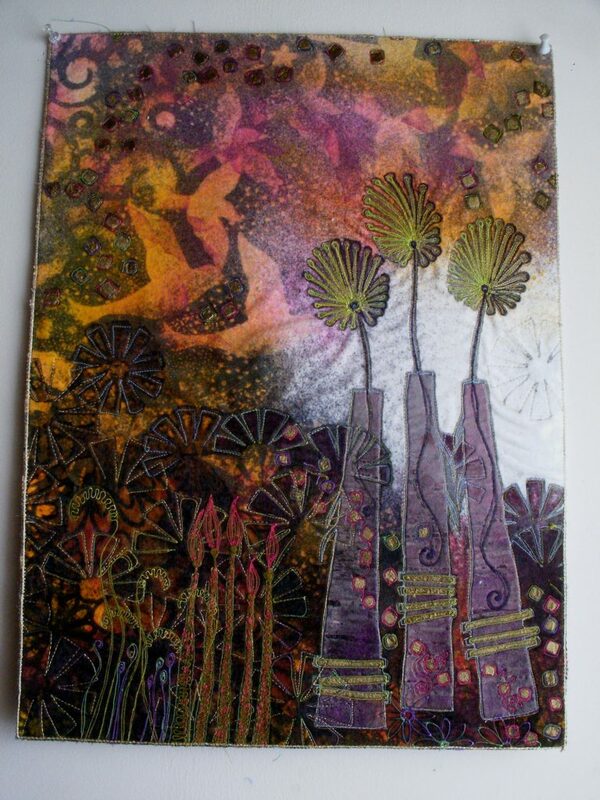 I recently read Indigo by Catherine McKinley because I am revisiting old dying techniques like Indigo and Procion because I am preparing for a beginner’s guide to Indigo workshop at my studio. I’m also revisiting Colour by Victoria Finlay which covers lots of amazing cultural dye references. I’ve got a large collection of useful reference books. I prefer to trawl through books rather than the net for information. I remember one of my aunts saying ‘if you can read, you can cook’. I think the same about making something. 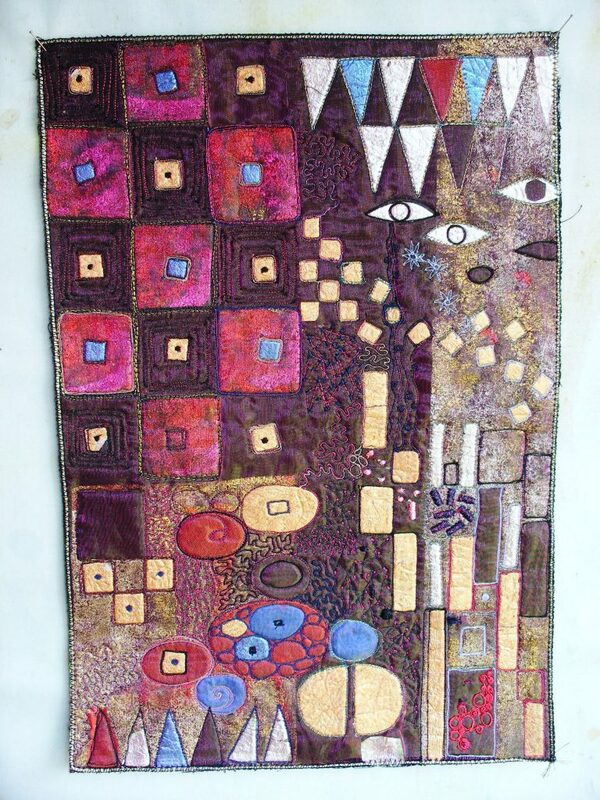 You can follow instructions on how to make a cushion or a quilt but things change when design and creativity come in to it. I’m not sure that creativity is totally natural but as a teacher I’ve found that anyone can be taught to make something. I have worked in schools where the students did not want to learn about textiles – that’s hard but if they meet you halfway then the magic starts to happen. What was your first memory of embroidery – who taught you your first stitches? My Mum Miriam Evans. She wasn’t a stitcher but she encouraged me to make things. I remember making a soup dragon from the Clangers with felt. She preferred pottery or painting…..she was always making something. Cornelia Parker, Klimt, Hundertwasser, Ben Nicholson, I just watched a documentary about Leonora Carrington which I loved! Alice Kettle (my first love), Val Holmes (for her brilliant books on machine stitching), Maggie Grey (for …well… everything), Gwen Hedley (great writing and meticulous research)….loads more, I could go on and on. I think there was a moment, when I discovered machine embroidery back in the 90s. I battled with my old Frister Rossman Cub 3 it wasn’t entirely geared up for free motion I worked without a foot on but the machine didn’t really work well so in the end I tried taking the foot pressure off, dropping the feeds and using a see through straight stitch foot. Wow my world was transformed! 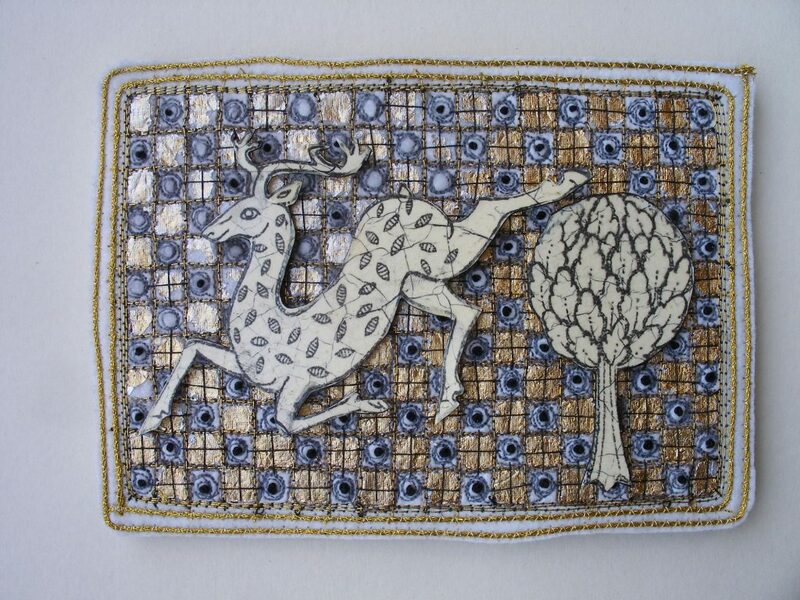 I practice machine stitching on a daily basis, in fact ‘practice’ is the word isn’t it. In the 90s when I began I used text in my work, I lived with a poet and I had a studio in the same building as a letterpress printing works. 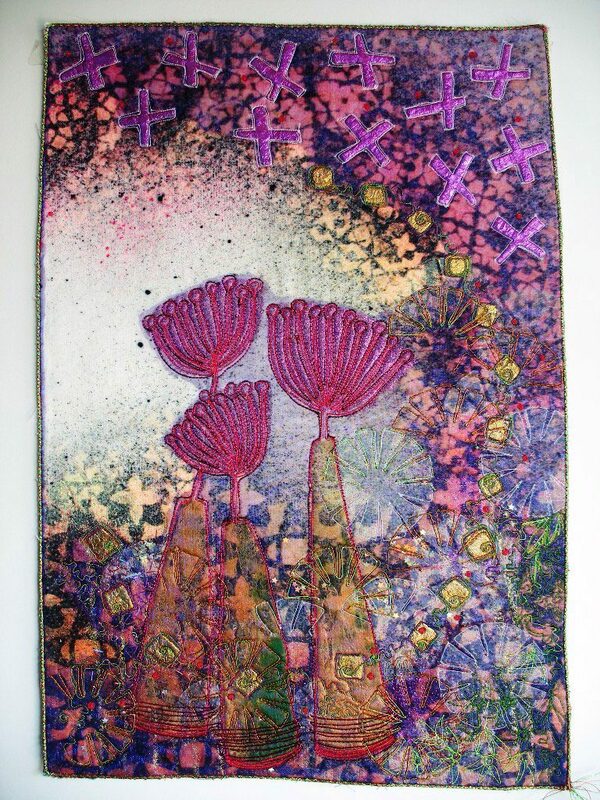 I began mashing poetry and textiles together with my favorite embroidery technique. Twenty odd years later I’m now influenced by plant forms, wild gardens, hedges and under growth. 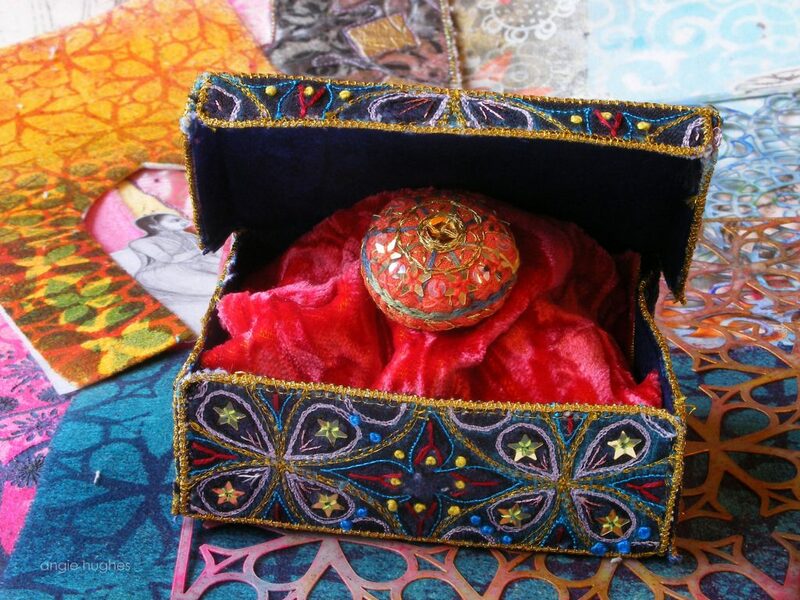 Through all of this my first passion machine embroidery in a particular style that is recognizable as my voice. Do you ever feel de-motivated and how do you stay motivated? Yes often… I have a few ice breakers. Gather a few familiar materials to experiment with and throw in a new one that you haven’t tried. Dig out your favorite art books and study the images carefully you may see something you hadn’t seen before to inspire you. Finish something (UFO’s)….I know lol!! 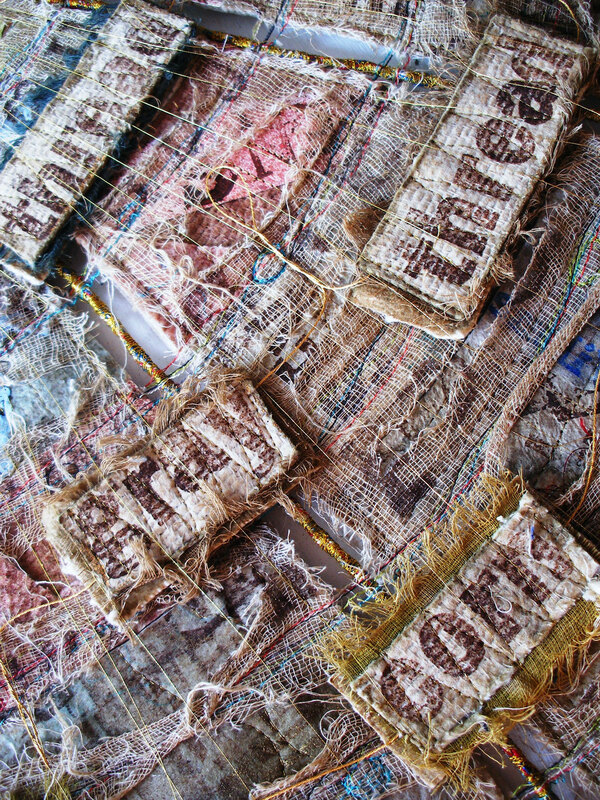 Flick through old textile magazines…..there will be lots of ideas and one will surely trigger something. Go to a Guild meeting, talk with like minded people, listen to a great speaker. Failing that, slump in a comfy chair, read a good book and try again tomorrow. What advice would you give to students who are undertaking courses with us? Many of them have aspirations to give up the ‘day job’ and work full time in textiles, so any insights into this area would be wonderful for them. Oh the last and hardest question of all. I do work for myself in textiles 80% teaching and 20% making for shows. As I’ve mentioned I started training in the 90s finishing 2002 I’ve been transitioning ever since from full time employment to self employment. It took a few years! Yes you can do it but it’s hard work, I never wanted to be a full time artist or maker so the teaching works well for me, I think it’s what I’m here to do. I’ve moved recently and I now have a dedicated studio that is all mine. I don’t know what will happen next but I quite like that uncertainty.